When Matt Klubeck landed in juvenile court four years ago for throwing a piece of steak at his mother's boyfriend during an argument, he figured the judge would dismiss the simple assault charge that had been lodged against him. Instead, Luzerne County Judge Mark Ciavarella denied Klubeck his right to an attorney, presided over a hearing that lasted barely a minute or two, then forced the 13-year-old - only 4-foot-2 and 82 pounds at the time - to spend 48 terrifying days in a youth detention center. 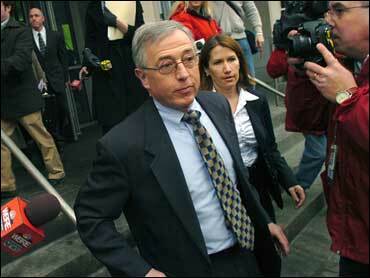 Klubeck was among hundreds of juveniles Ciavarella sent to a private lockup run by PA Child Care LLC. In exchange, prosecutors say, Ciavarella took millions of dollars in kickbacks in one of the most egregious cases of judicial corruption ever seen. On Thursday, Pennsylvania's highest court overturned hundreds of juvenile convictions issued by Ciavarella, ruling the disgraced judge violated the constitutional rights of youth offenders who appeared in his courtroom without lawyers between 2003 and 2008. For Klubeck, who sank into a scared, lonely depression as he did time with much larger boys who had committed far more serious crimes, the decision means vindication - and a fresh start. "This is great. This is great," said an exultant Klubeck, now 17, given the news by a reporter. "I can't believe he tried to ruin kids' lives in exchange for money. I'm glad he got caught." Federal prosecutors charged Ciavarella and another Luzerne County judge, Michael Conahan, with taking $2.6 million in payoffs to put juvenile offenders in privately owned lockups. "Today's order is not intended to be a quick fix," Chief Justice Ronald Castille said in a statement. "It's going to take some time, but the Supreme Court is committed to righting whatever wrong was perpetrated on Luzerne's juveniles and their families." The Supreme Court approved the recommendations of Berks County Senior Judge Arthur Grim, whom the justices appointed in February to review cases handled by Ciavarella. He decided that expungement was the most appropriate remedy for low-level offenders who appeared in Ciavarella's courtroom without lawyers - a group he has said numbered "easily into the hundreds." Under Pennsylvania law, a juvenile may not waive his right to an attorney unless the decision is made "knowingly, intelligently and voluntarily." The judge must also formally question defendants to make sure they understand their rights, something Ciavarella routinely did not do. In a report to the Supreme Court released Thursday, Grim said he has determined that "a very substantial number of juveniles who appeared without counsel before Judge Ciavarella ... did not knowingly and intelligently waive their right to counsel." Grim next will review cases involving more serious juvenile offenses. Prosecutors have described a scheme in which Conahan, Luzerne County's former president judge, shut down the county-owned juvenile detention center in 2002 and signed an agreement with PA Child Care LLC to send youth offenders to its new facility outside Wilkes-Barre. Ciavarella, who presided over juvenile court, sent youths to the detention center and to a sister facility in western Pennsylvania while he was taking payments, prosecutors said. Even before the scandal became public in late January, youth advocates had complained for years that Ciavarella was a harsh jurist who deprived youths of their constitutional rights. Youths were routinely brought before Ciavarella without a lawyer, given hearings that lasted only a minute or two, and then sent to detention for offenses as minor as stealing change from cars and writing prank notes. In his report, Grim said "there was routine deprivation of children's constitutional rights to appear before an impartial tribunal and to have an opportunity to be heard." "Their failure to either individually or collectively speak out against what was going on in Judge Ciavarella's courtroom, I think, let all of these kids down," Levick said. Hillary Transue, 17, who appeared in Ciavarella's courtroom in 2007 and spent a month in a wilderness camp for building a MySpace page that lampooned her assistant principal, was elated that her record would be expunged. She did not have an attorney when she went before Ciavarella, nor was she told of her right to one. "I feel incredible, not even just for myself, but for everyone who is involved in this whole thing, all of the kids who are going to have clean records now," Transue said. The judges and others tied to the scandal face at least three lawsuits, including one filed by the Law Center. A defendant in two of the lawsuits, former Chief Juvenile Probation Officer Sandra Brulo, illegally tampered with juvenile court records last month in an attempt to evade liability. She pleaded guilty Thursday to a federal charge of obstruction of justice.